Do you remember reading Clinton Kelly's little essay on Facebook about how we dress ourselves? It was after he was done filming What Not to Wear and it was such a fabulous little piece, coming from the heart of a very sincere and caring man. Below is an excerpt. You should follow the link to read the whole thing, but I want to be sure that you read at least this part because it's important for what I'm going to say. "I don’t care what you wear. I really don’t. And I don’t care what you think of what I wear. I really don’t. I care what I wear. And I think you should care about what you wear. Your style can make you happy, and even though I don’t know you, I’d like you to be happy, because as a human being, you deserve to be happy." 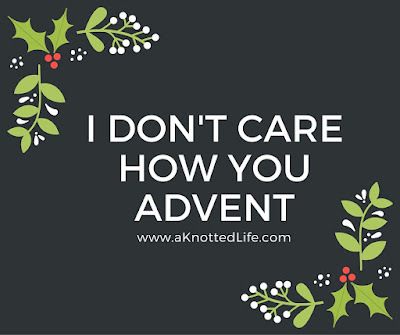 This year I'm seeing a little bit of backlash online, a response to all the posts on "how to do Advent" and "how to celebrate the feast days" and "how to live liturgically." Some of the posts seem to target bloggers like me, the ones who enjoy writing about what we do and why, showing lots of pictures along the way. I guess sometimes it doesn't matter if a person writes a big intro paragraph explaining, "When I was a new mom, figuring all this out, these kinds of posts were so helpful to me so here's what we do - take what you like and leave the rest, or leave it all! It's what works for us and we enjoy it!" In the end, a person can still feel overwhelmed by all the options and guilty about all that's not happening in their home. I don't care what you do in your home to celebrate the holy days and seasons. I really don't. And I don't care what you think of what we do in our home. I really don't. I care about what we do. And I think you should care about what you do. Making our homes domestic churches can make you happy - building a family culture and bringing meaning and joy to your every day life and faith - and even though I don't know you, I'd like you to be happy, because as a human being made in the image and likeness of God you deserve to be happy. I am not the liturgical living police, judging your holiness and abilities as a Catholic or parent based on how or if you do St. Nick, if you bake Santa Lucia rolls from scratch, if you even know who St. Lucy is, if Santa comes to your house on Christmas, if you have a Jesse Tree, if you sing around your Advent wreath, if you forbid all Christmas music from your home before Dec 25th, if you do something for Epiphany... and so on. If listening to Christmas music in October makes you happy then great, listen to Christmas music! If you find embroidering your own Jesse Tree ornaments to be the best thing ever then great, embroider away! If you only give your kids gifts on Epiphany then great, live it up with the Three Kings! I know that in her wisdom the Church gives us the liturgical calendar, feast days, and the traditions that surround them to help us grow closer to Christ. I want you to grow closer to Christ. I hope my blog has helped you do that. I have enjoyed the conversations here and around the web about our differing opinions and perspectives and preferences. The only judging I'm going to do is the kind that comes from weighing if your ideas would work for my family. If they do - awesome. And if they don't - awesome. How great that there are so many ways to do this the right way! And yes. The guilt has got to go. I find the "how we do it" posts helpful; I didn't grow up with any religious traditions and so it's been helpful to get ideas from other blogs. It's sort of like pinterest...take what you want and leave the rest. That said, I think you do a good job of presenting "real life" on your blog. I feel like a lot of mommy blogs are either "everything is so chaotic and overwhelming" or "everything is picture perfect". I"m not a blogger, so perhaps it's very hard to strike the balance -- but you do a good job! This is great!! Thanks for the reminder. Your video for converts is perfect!!! Thank you for sharing the link! I think this is one of those times that being a "cafeteria Catholic" just makes sense. (Not in what doctrine to follow), but for real, how you Advent is how you Advent. I love this posts that offer lots of ideas and I take what works and leave the rest. My struggle is not comparing how "well" we are doing this year with how "well" we did last year or the year before. Comparison is the robber of joy, even when you do it to yourself. Thanks for this post. Honestly right now I'm satisfied with Clark getting excited about "baking Santa cookies then seeing the baby Jesus born." Happy Advent! This is great. And you're right - when you're overwhelmed and feel like being a disorganized, brain-in-a-jar, wish-you-weren't-working-working-mom is preventing you from doing anything meaningful at ALL in your domestic church (which of course could never be true, because clothing/washing/feeding/playing with/reading to children is making LOVE present all the while), and you're feeling so discouraged, the only thing that really helps is hearing about the time that Jennifer Fulwiler could really only manage to get a package of purple napkins one Advent. And you sight a sigh of relief and chuckle and realize - napkins. It's all about the napkins :) But seeing pictures of anyone else's anything, no matter what the disclaimer (sometimes those make it worse - like the "sorry about the mess" from your neatest friend when you come over, lol! ), when you are in that mental state, can feel like another reason you'll never be any good. But that's not to say the pics shouldn't be shared and the posts shouldn't be posted! I struggled with that for a time, but as soon as I gave myself permisison to just do 1 thing, or 1 or 2 things, or a couple little things, and not feel bad that I couldn't do all the things - it actually got so much easier to add things and get things done, if that makes any sense at all. It's the stress of perfectionism, comparison, insecurity, and mommy-guilt that is so undercutting and undermines our joy. Now I wonder who'd want that for Catholic moms everywhere....could it be....;) ?!! Not a chance we can let that take over the most beautiful and peace-filled anticipatory season that promises to bless our children and us. All the high fives!!! Love this post. I listened to Bing Crosby White Christmas last night. And I *did not* feel guilty. lol! Even though we do try to avoid Christmas-music-ing it up during Advent, I was up with a sick baby, and Bing is soothing....it was lovely. I am, though, super excited to see your Advent playlist! I read this and can't stop thinking about it. The quote from Clinton Kelly is so great! I can substitute so many things for fashion - and it basically stops all the mommy wars. So good! Gosh I love this Bonnie and it's so refreshing to me. 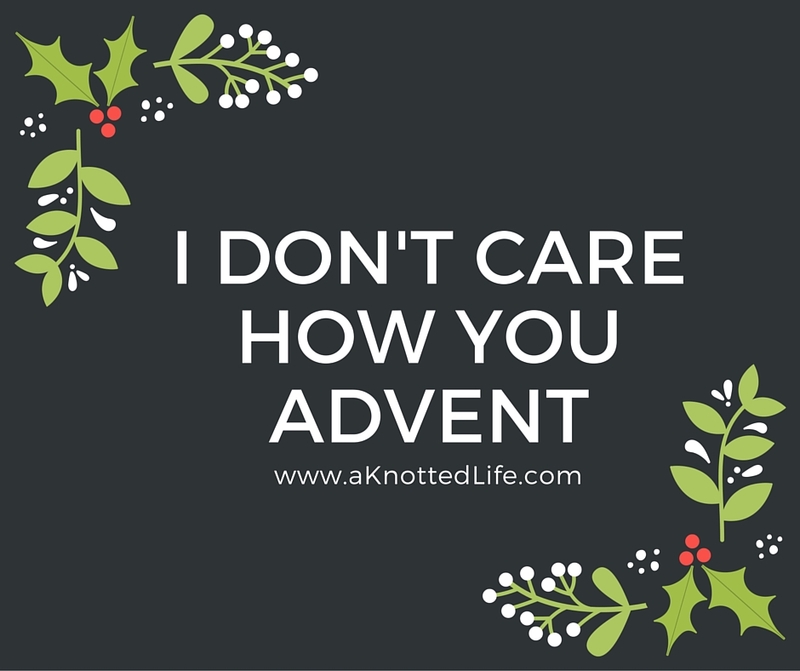 I tend to shy away from all Advent and Liturgical blog posts from other bloggers because I do feel like sometimes they come off as "look what we do" or "look what you're NOT doing that maybe you should be". And maybe I'm just too sensitive because we're still working on figuring out and creating our own traditions so it's all a little overwhelming. Anyway, thanks.